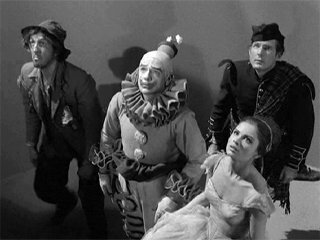 I would be remiss if I didn’t comment on my all-time favorite Twilight Zone episode, Five Characters in Search of an Exit. It depicts five people with easily identifiable roles, a soldier, a ballerina, a clown, etc., who find themselves in a plain white cylinder that is open at the top. They don’t know how they got there, have no memory from before they got there and don’t know what the cylinder is. Periodically, the deafening sound of bells ringing rattles the cylinder. The soldier motivates them all to try to escape through the top and they try various means. Finally, one goes over the top and the rest remain puzzled as to where he went. The scene then shifts and the ending is both amusing and deeply depressing. I’ve read some reviews online that trashed the show. I don’t think they get it. For me, this show is an allegory of the human condition. How did we get here? Why are we here? And what happens when we go “over the top?” Fundamentally, we have no greater understanding of these deep questions than the characters in that cylinder. Maybe I was in my most deep existential angst stage at the time, but that show haunted me for years. Still does.